Intelligent chargers follow battery impedance to end of charge cycle for all battery types. Fully automatic. Red LED indicates AC power on, yellow LED indicates battery is charging, green LED indicates float mode. Aluminum case. World–Wide Universal AC Input 90 – 260 volts, 50/60Hz. 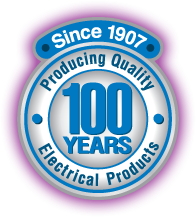 Charge control: modified constant current charge to a constant finishing voltage then to a float standby. Fully automatic 3 stage charger can be left on the battery indefinitely. For any type lead acid battery, including conventional, maintenance free, deep cycle, gelled-type, valve regulated batteries. Click link below for full catalog data sheet pdf. 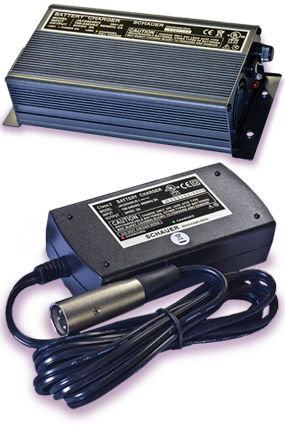 Charge control: constant current charge to a constant voltage, then to a float standby. 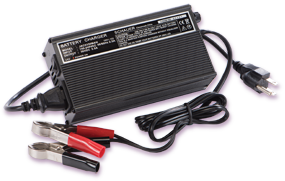 Fully automatic 3 stage charger can be left on the battery in maintaining/float mode. Can be set for any type lead acid battery, including conventional, maintenance free, deep cycle, gelled-type, valve regulated batteries. Cyclic Voltage: Flooded 2.47 volts/cell; Gel & AGM 2.4 volts/cell. May be preset to customer’s specification for battery type. Not intended for use as a DC power supply. Continuous – 100% duty cycle. Low voltage start: will start charging a deeply discharged battery with low terminal voltage. 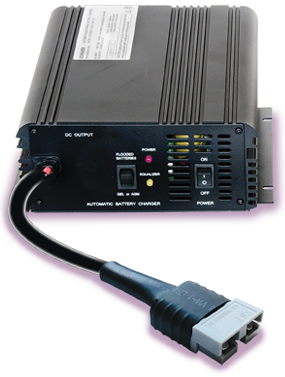 Click link below for Power Equipment Adapters pdf. Low voltage start: will start a deeply discharged battery with low terminal voltage. Reverse polarity and short circuit proof. Extend the life of your batteries with this battery maintainer. Prevents battery sulfation during equipment storage. Maintainer for 36-volt or 48-volt battery systems. Use on 10 to 300-amp hour lead acid batteries, typical of golf carts, industrial scrubbers, etc. Red LED indicates AC power on. Yellow maintaining at 2.5 amp. Green maintaining at 1 amp or less. 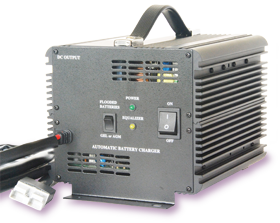 Fully automatic, 3 stage charger can be left on the battery in maintaining/float mode. Red LED indicates AC power on, yellow LED indicates battery is charging, green LED indicates float mode.